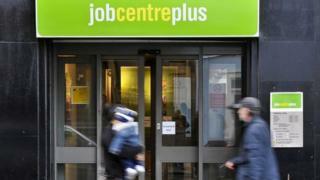 Scotland's unemployment rate fell to a new record low in the three months to February, according to official figures. The Office for National Statistics (ONS) said the jobless total fell by 8,000 from the previous quarter to 93,000, to stand at 3.3% - well below the UK figure of 3.9%. Meanwhile, unemployment in the UK as a whole fell by 27,000 to 1.34 million. The UK unemployment rate is now lower than at any time since the end of 1975. Figures showed employment among Scots of working age rose by 11,000 to 2,602,000. The rate now stands at 75.6% - its highest level since the March to May period last year. Scottish Economy Secretary Derek Mackay said: "While Scotland's economy and job market continues to grow, the UK government's Brexit plans, in whatever form, will cost jobs, make people poorer and damage our society. "It is essential the extension granted by the EU is used constructively and not wasted. "The ongoing talks over EU exit must include the devolved administrations, and for any deal agreed by the UK Parliament to be put to a second referendum." The UK government's Scottish Secretary David Mundell said: "It is great news that unemployment in Scotland is at a record low, coupled with the rise in employment. There is a lot to be positive about. "Scotland's two governments are working together to strengthen our economy and create jobs, with our growth deal programme reaping rewards across the nation. "The UK government's investment in growth deals is now more than £1.35bn, showing our huge commitment to growing Scotland's job sector and economy."